Today, the Global Leaders organized a tour of the Kori Nuclear Power Site located in Gori, a suburb of Busan. 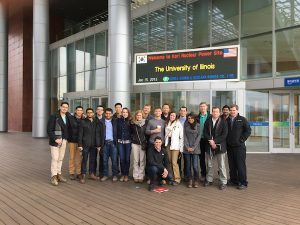 The tour offered us an overview of what the site’s capabilities were, a feel for the scope and scale of a nuclear power plant and summary of what nuclear fission is. The agenda for the tour was an overview of Posco’s new APR 1400 nuclear facility series and a tour of the active Shin-Kori 2 nuclear facility. We were greeted at the Korea Hydro&Nuclear Power Co., LTD main office with a warm welcome and then escorted into the auditorium for an overview of the APR 1400 series. APR 1400 is POSCO’s latest series of nuclear facilities which is capable of producing 1,400 megawatts of electricity. Design for the technology was completed in 2002 after 20 years of research and development. Prior to the completion of this design, all existing nuclear facilities in Korea were designed and constructed using techniques and technologies from the United States. In 2007, the completion of Shin-Kori 1 and 2 marked the first steps towards Korean nuclear independence. Two years later POSCO made its first export of APR 1400 design and technology to the UAE. 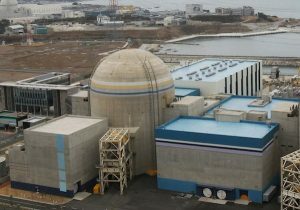 Today, the construction of Shin-Kori 3 and 4 is underway and is expected to increase the energy supply for Korea’s southeast – currently 40% of Korea’s energy supply comes from nuclear. A demonstration of the sophisticated APR 1400 virtual tour and operation software expressed the capital and time POSCO has invested for the development of safety in their facilities. This virtual world allows maintenance and operation personal to analyze working conditions in active nuclear facilities and limits the potential exposure to radioactive material. Following the presentations, the security process to enter the active Shin-Kori 2 facility began. Prior to our arrival, all GLCM members filled out several sheets of security documentation in order to be cleared to tour. On-site, we exchanged our passports, cell-phones, cameras, and fingerprints for a security badge and were told politely, yet firmly, that “if you lose your badge, you will be staying here with us.” After check-in all that was left was metal detectors, fingerprint turnstiles, and one last badge scan and we were on our way. Shin-Kori 2 requires 24-hour operational control from its central command center. Of the mere 25 people authorized to manage the facility, six must be present for all three 8-hour shifts daily. Because the nuclear facility does not take breaks, the management team must remain in the control center every minute of every shift every day – no holidays off at Shin-Kori. A plus for the command center is the wall to wall of monitors and gadgets allows the team to remain away from many dangerous locations which could expose them to radioactive materials. Entering the large turbine room allowed us to understand the scope of what the facility was actually doing. Shin-Kori 2 consists of two water systems: a closed purified loop and an open unfiltered system. The closed loop is heated into steam from the nuclear fission to power massive turbines that produce the 1,400 megawatts of electricity. The open system draws in 60 tons of water per second from the ocean in order to cool and condense the steam back into purified water – that is roughly 1 billion gallons per day. Even though we were standing behind a protective wall, the heat from the many steam pipes radiated out and the temperature difference was obvious. After the turbine room, our guide directed us to what was truly the coolest experience of the tour – the fuel assembly storage pool. A small informational exhibit was perched above the storage pool and glass windows allowed the view below. Many have seen videos of giant cleanrooms with enriched uranium fuel cells being stored underwater, but to see the decayed uranium fuel cells glowing throughout the water in person was fascinating. Our guide then briefly explained the nuclear fission process, which is summarized below:Nuclear fission begins with the firing of an initial neutron through what is called the fuel assembly – sketch below. 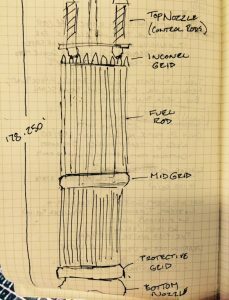 The fuel assembly for this facility is comprised of a central tube, four control rods, and 177 fuel rods. The shot is fired through the central tube and sparks the nuclear decay of uranium particulates within the tube. Fission then radiates outwards through the 177 fuel rods with the control rods height position determining the rate. Once a fuel assembly is activated in Shin-Kori 2, it does not shut off for 18 months. Once it does shut down, one third of fuel rods must be replaced leaving the remaining two thirds to be repositioned.